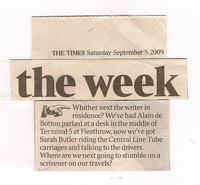 Sarah Butler was writer-in-residence on the Central line from March – September 2009, a commission by Art on the Underground which involved working with staff across the whole of the Central line. New writing, by Sarah, in collaboration with London Underground staff, is available online. Posters and booklets were distributed across the tube network in 2009.